On behalf of all those who use Our Lady's Hospice & Care Services, their family and friends, I would like to extend our most grateful thanks for your generous donation of €200. Your gift will allow us to continue to help our patients to live the last chapter of their lives to the fullest. Here at Our Lady's Hospice and Care Services, we provide specialist care to people with a wide range of life limiting conditions, both in our hospice and within their homes. Budget cuts and demands on our services mean that we have never needed the help of the local community more to maintain our services. This donation will help us to further develop our services and to give high quality specialist palliative care to our patients and their families. Thank you from all of the team here. Your kindness is truly appreciated. Rosie & Jim donate a Chicken Hamper to the fundraiser event by the Royal School Cavan Parents Association. The funds raised are for sports facilities and a baby monitor for Cavan General Hospital. A very worthy cause. "..I would like on behalf of the Royal School Cavan Parents Association to thank you most sincerly for your generous donation of a chicken hamper for our Monster Auction held on Friday last March 24th in the Cavan Crystal Hotel, which you donated via Georgina McCaffrey. We raised over €18000 and are deeply indebted to the many local businesses and those further afield, including yours, for the success of this fund-raising event. 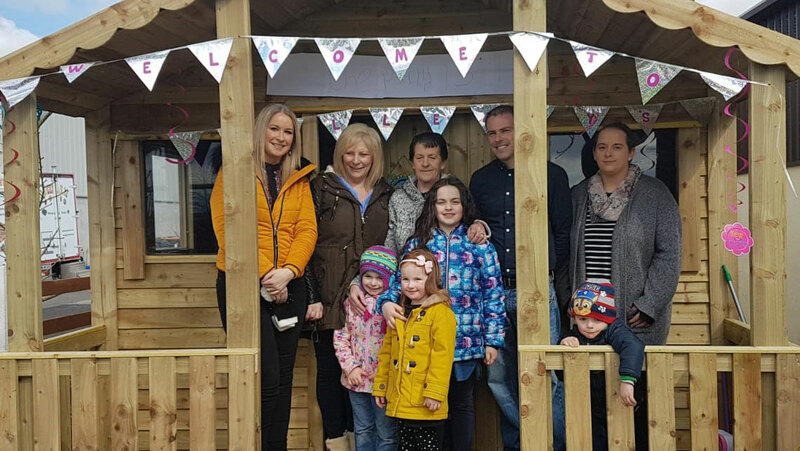 The funds raised are for the indoor sports facilities and towards a baby monitor for the special care unit of Cavan General Hospital. Wishing ou every success in the future..."
Musgrave Triathlon 2017 is coming up shortly and is celebrating its 15 year anniversary this year. Pieta House, BUMBLEance, Breakthrough Cancer Research and Cork Penny Dinners. Sean called over to Musgraves to present Rachel Hannon with her cheque today, Thursday 11th August. The Triathlon is on Saturday August 26th 2017 in Farran Woods, Cork. Rosie & Jim are humbled and thrilled to Make-A-Wish come true for Danielle. Danielle, aged 4, from Sligo, is living with Acute Lymphoblastic Leukaemia. She loves playing and really wanted a playhouse for her and her siblings/friends to play in. She specifically said green because she likes the idea of a green playhouse in the garden. Her favourite colour is pink and she loves dancing and singing. She can’t really travel and shares a room with her sister so having a space of her own is what this wish is all about. 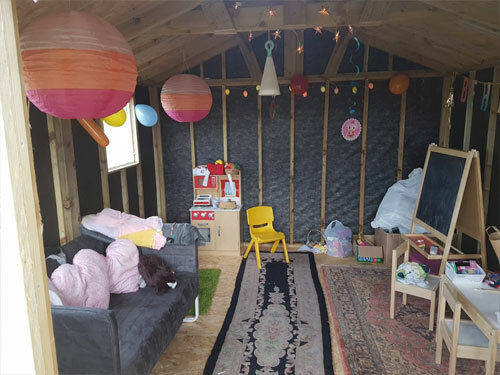 "Thanks to the generosity of Rosie & Jim, Make-A-Wish were able to get her an amazing and spacious Summerhouse and include fantastic interior furnishings to turn it into a cosy, multi-functional space. 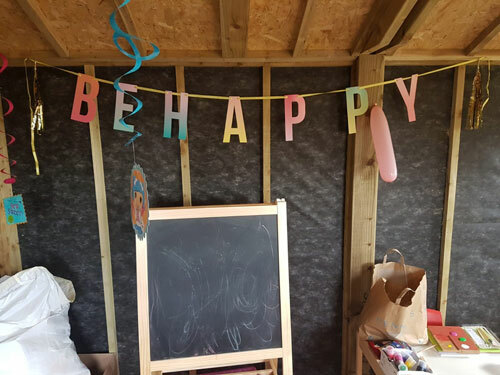 On the day of the reveal, Danielle’s mum, with the help of our amazing volunteers Martina and John, threw a party for Danielle and the whole family, where everyone got to have a go at the Karaoke machine and some arts and crafts! Thanks again for your support, as you can see you have made a little girl extremely happy!" Thank you so much for your wonderful support - just look at the smile on Danielle's face! Rosie & Jim are delighted to have donated £400 to a fundraiser for 12 Community Defibrillators. The fundraiser is being organised by our UK Butchers - Hugh Black & Sons Ltd.
Hugh Black & Sons are raising funds to purchase 12 Community Defibrillators for each of the communities in which High Black & Sons Butchers operate a shop in communities throughout Scotland. Over 40 members of staff have already been trained in CPR and how to use the defibrillators. Well done to Hugh Black & Sons staff - it's a fantastic and ambitious fundraising challenge and one well worth supporting! We at Rosie & Jim are delighted to announce that our total donations to Irish Charities and Community Groups throughout 2018 came to just over €31,556. In addition Rosie & Jim also donated more than 600 kilos of chicken products to Irish charities and those who provide support to the less well off in our communities.